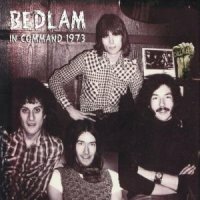 One friend recently rather cruelly referred to Bedlam as ‘the line on Cozy Powell’s CV between the Jeff Beck Group and being a pop star’ which is quite unfair on the strength of this album; in fact, it’s hard to see why Bedlam didn’t go the distance, really. Brothers Dave (guitars) and Denny (bass) Ball, hot from the demise of Big Bertha, hooked up with vocalist Frank Aiello and one Cozy Powell towards the end of 1972 and Bedlam – after a brief stint under the name Beast – was born. But after just one self-titled studio album released in August 1973 the band hit the buffers. This set was taped on 22nd October 1973 – the date does have some significance – at the Command Studios Theatre in London and features, as you may expect, four extremely talented musicians contributing both individually and collectively to a hefty wodge of driving Seventies’ hard rock, not dissimilar to the overall sound of Nazareth, Uriah Heep and the like (in fact opener ‘I Believe In You’ could easy be Uriah Heep without the keys). The extended work-out that is ‘Sarah’ together with ‘Seven Long Years’ (linked by some superb solo tub-thumping by Powell) ably showcase what Bedlam were all about – catchy songs, fluid solos and pure instrumental virtuosity – as does ‘The Fool’: an eleven-minute monster that comes over all slow ‘n’ bluesy at first before shifting gear and allowing firstly the bass-playing Ball and then his six-string brother to strut their stuff. OK, so ‘Mother In Law’ is Bernard Manning-esque crap, but serves at least as a sign of the times.